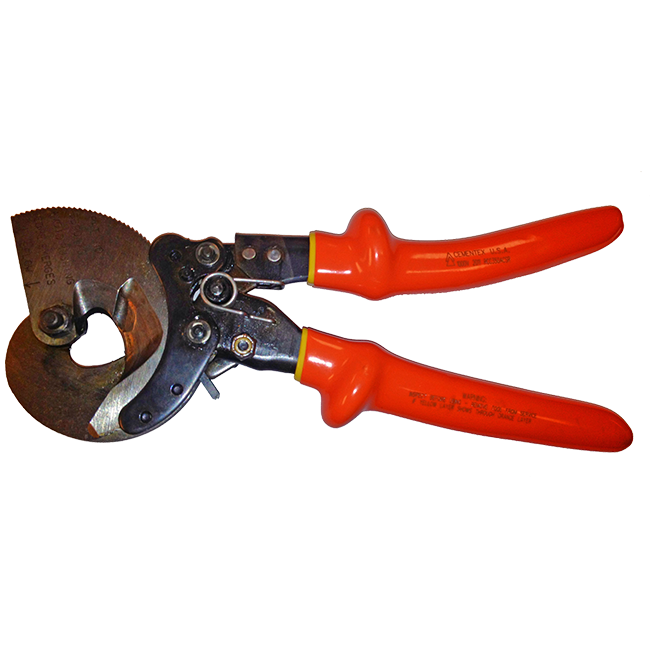 Cementex aluminum conductive steel reinforced ratcheting cable cutters are tested to 10,000 volts and rated for use up to 1000 Volts AC and 1500 Volts DC. There is a lifetime warranty on tools; two year warranty against manufactured defects on insulation. Able to get into confined workspaces. Extra heavy duty C-type jaws. Thumb slide release allows rapid cutting and closing. Cutter for Aluminum & Cooper Cap. 350 MCM (185mm²); 33 ACSR. Unique designed moving blade minimizes cable distortion. Locking mechanism for safe transport.